Spend a night inside the world’s largest dog. 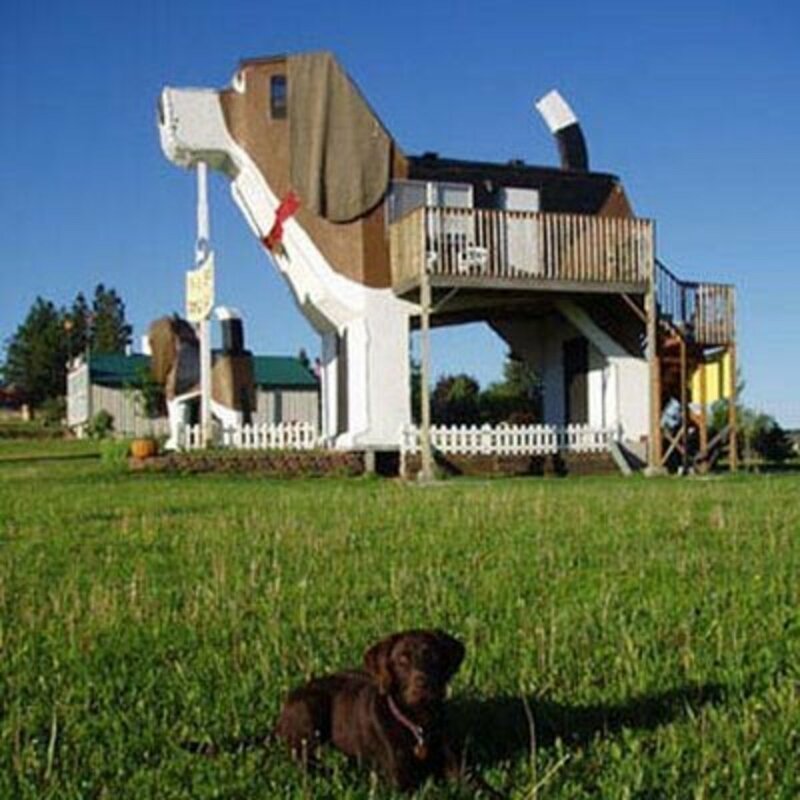 This 34 foot (11 meter) two-story tall bed and breakfast is shaped like a beagle and comes complete with giant carpet ears that flap in the wind. And the dog theme doesn’t end there. Inside the spacious doggy suite is canine paraphernalia of all sorts including dog-shaped cookies left on the bed pillows. Outside, a giant red fire hydrant doubles as -- what else? -- an outhouse. The kitsch factor here is high. But at rates starting at a very reasonable $86/night the Dog Bark Park Inn is a piece of Americana not to be missed. Wow. This two-chamber hotel 30 feet (10 meters) underwater truly feels like you are spending the night in a different world. Guests are surrounded by views of tropical fish and lagoon water. But the vibe of this place is what makes it truly memorable -- the lighting and sounds here are different than they are living on land. And since no hotel staff stays overnights below you’ll be free to explore around this underwater space station in privacy. To make the dive down to the lodge guests are required to take a three hour course if they are not already scuba certified. “Mer-chefs” are available to cook dinner. One guess what sort of food is on the menu. There are several cottage resorts around but few are as luxurious and none have accommodations as unusual as northwest Connecticut’s Winvian Cottages. Each of the Winvian’s 15 cottages are designed by a different architect and have their own flair. The Library Cottage is centered around double-story wrap-around book shelves. The Threehouse Cottage is a two-story wonder built amongst the leaves and branches 30 feet above the ground. Perhaps the most unusual choice is the Helicopter Cottage. This “cottage” is large enough to contain the whole of a Sea King Pelican helicopter, though back when the U.S. Coast Guard was flying it we suspect this ‘copter didn’t contain the minibar, sofa and flat screen TV it has today. Ride the rails without going anywhere. 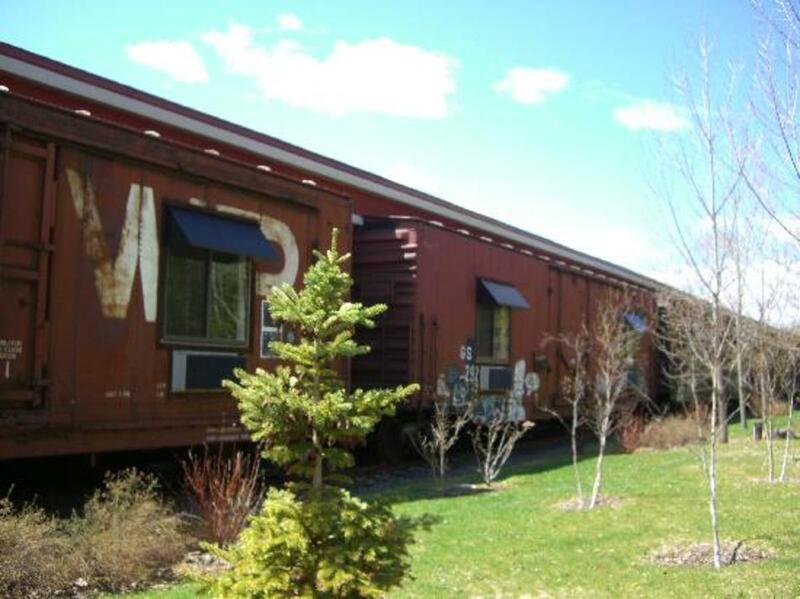 At a bed and breakfast north of Duluth, real train boxcars have been converted into hotel accommodations. The best rooms are the conductor suites that occupy an entire rail car and includes a king bed, large tub and elegant living area. Guests can complete the rail experience by visiting the nearby Lake Superior Railroad Museum. Rates from $139 in the summer, $79 in the winter. There are other treehouse hotels in America but none are as dramatic as Cedar Creek. Here, 200-year old trees literally grow through the kitchen, bedroom and living spaces of the five-person bed & breakfast suite. 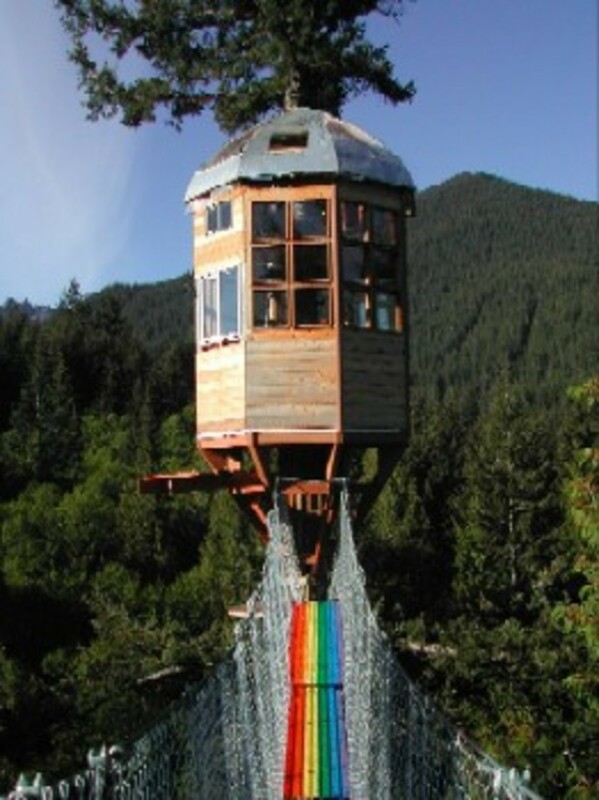 Coolest of all is the observatory tower, which is more than 100 feet (30 meters) above the forest floor and reached via a suspended walkway and the “stairway to heaven” that spirals around a giant Douglas fir. For many of us the thought of going back to elementary school is a nightmare. If you happened to attend the Kennedy School in Portland, Oregon, you can return in style. This historic building looks much like it did when it was an elementary school -- chalkboards still hang on the walls and one can still imagine kids running through the front doors. The former classrooms, however, have been converted to comfortable hotel rooms. Each has been retrofitted to include a private bathroom and internet access. The room rate includes free admission to the next-door movie theater and use of a nearby pool. Unfortunately pets are not allowed, so you won’t be able to use that “The dog ate my homework” excuse. The teepees rooms at the Wigwam Motel were designed in the 1950s to be a Native American themed resort. 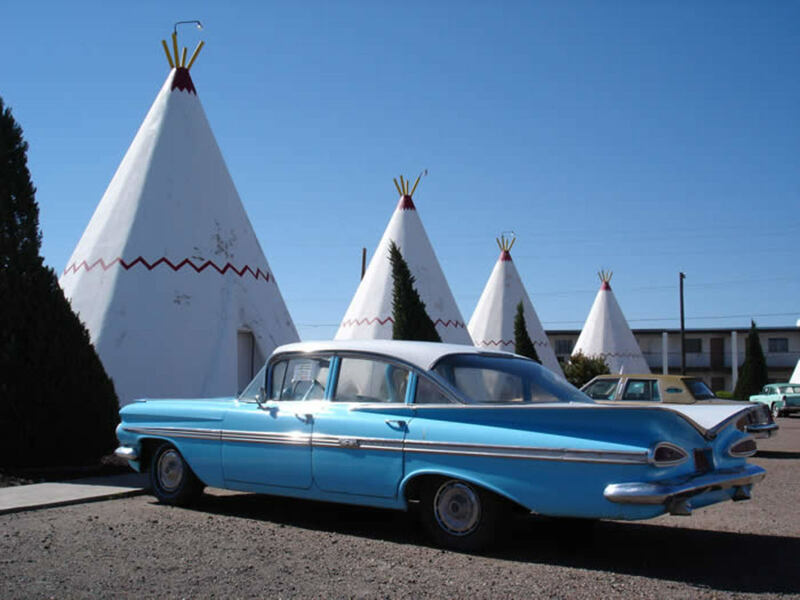 Today, the Wigwam Motel is a 1950’s themed resort that harkens back to the days of great road trips along Route 66. The theme-within-a-theme can send your head spinning. But the vibe at the Wigwam resort is undeniably fun. The motel is very family friendly and comfortable if not exactly luxurious. The 15 steel teepees come with cable TV, full bathrooms and air conditioning. Rates from a mere $54. The idea of sleeping in a cave might sound claustrophobic and uncomfortable, but at Kokopelli’s Bed & Breakfast it is neither. This spacious 1,6500 square foot underground suite includes a large screen television, waterfall-style shower, kitchen, washer, dryer and Jacuzzi. The room, once a geological research station, is built 70 feet (22 meters) into the 65-million year old sandstone of the New Mexico desert. For guests there’s also an observation deck offering vast views across five states during the day and stunning stargazing at night. You’ll need a little dexterity to get between the room and your car -- the way includes a few-minute walk along a ledge and a steep ladder. The reward for those who make the trip, though, is one of the most amazing and unusual hotel rooms in the United States. See a growing number of usual hotel reviews at Spot Cool Stuff. Copyright © 2008, Spotcoolstuff.com, All rights reserved. These hotels are really cool! I like the fourth one where the hotel is built into a train car. I think it would be very fun to stay in. I also like how it is a bed and breakfast. My wife and I love to go to bed and breakfasts. I would like to try this out someday. This was Awesome! I want to go visit all of them. 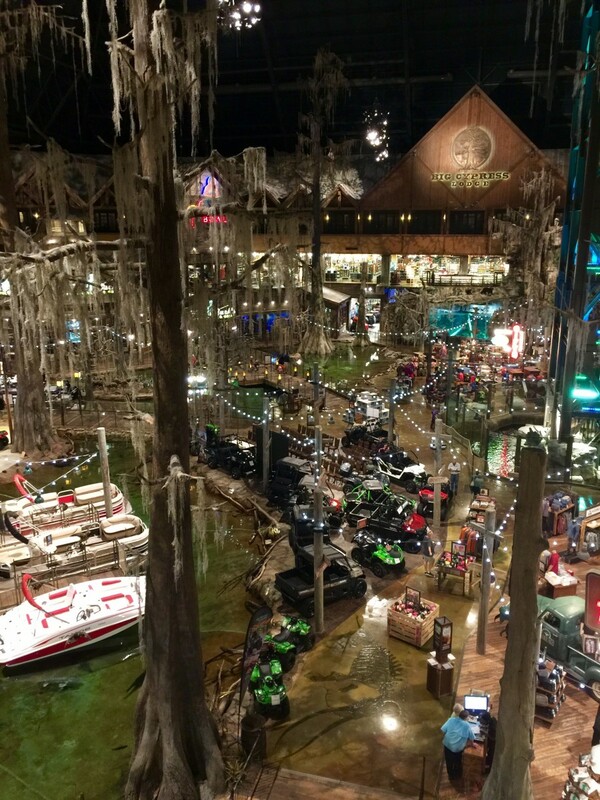 Its amazing how these fun places are right here in America and they are for the most part decent prices. What a fun and unique vacation. Thank you for this. Helps much. Great hub, but you forgot the Madonna Inn in San Luis Obispo, CA. There are 110 rooms of every cheesy theme imaginable. I stayed there once...it was surreal. Jules' Undersea Lodge. Steve Zissou's kind of hotel. And mine. Thank you, all of these hotels are awesome. Love the Beagle. very cute. 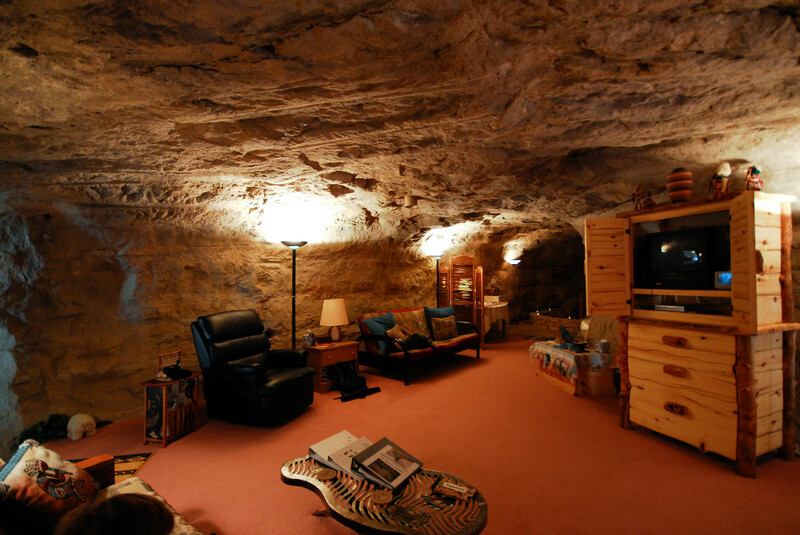 Oh, that cave room rocks! I read of sleeping in 2 by 2 feet drawers. But these take the top billing for "weird" places to spend the night. I love the Cave Bed & Breakfast! There's some great stuff out there in the States. I'd never heard of any of these before I read the hub. Well done for seeking them out! That really is COOL Stuff! Good hub.